I'm going to slip this card in with my daughter's stuff (somehow) when I see her this weekend. She is about to leave the country, spending the next several months abroad. And if you remember, she did this a year or so ago. It was difficult, because she is a bit of a nomad and off the grid when she's abroad (no phone/computer). So, we don't talk as often as we do when she is "Home"....mostly whenever she is able to use computers from friends or at a library...And I worry because I really don't know where she is...Hiking and traveling about with friend. Yikes. I get worried just thinking of it. Anyway, I just thought it would be nice to send her off with a little note from me. A little reminder kiss. The sentiment is from Unity Stamp Company, "Snowflake Kisses". The colorful striped button in the center - this is a very unique button that I acquired from Pinque Peacock! It's fabulous and I specifically created the bright card so that I could use it! And of course, the orange ribbon is 3GirlJam from the Harvest bundle...As I've mentioned previously, the orange is such a wonderful bright and cheerful color! So there you have it. And entire week of Unity goodness...finishing it off with a bright and cheerful card as the skies around here get colder and colder. Remember to comment on each of my posts this week, if you'd like to have a chance of winning the two itty bitty stamps of your choice! And hey, let me know how you fight off that winter chill! What a pretty card! I love the diecut and the pops of color against the kraft! Gorgeous!!! I just love those bright pops of color! Rebecca, did you know that tangerine is going to be the color in all the stores and mag's this summer.... so you did this one right. Hey, I am heading to costa rica for a month, will that help with your daughters travel's? visit my blog and let me know. Thanks for brightening my day with this colorful card! It makes me happy just to look at it. Gorgeous Rebecca..my heart goes out to you,my sons head off for a weekend and I worry till they arrive back and they have phone connection!!! She is going to love your card..bright and cheerful ! Great unity week and fabulous colorful card for your daughter! LOVE this card! Your color choice is awesome. What a bright cheerful card - I'm sure your daughter will love finding it. Love how bright and bold this card is! You did a great job this week! Rebecca, this has made the sun shine brighter for me today!!!! Darling bright colors and love the button in the center...fabulous job!!! Can't wait to peek back at GIU Days 1-4 now! Congrats on being the GIU Girl! Love this fun and creative colours. It makes a card. Love your card! Sooo pretty!! Oh wow...its tough when they grow up and leave the nest...but I would have a terrible time if my daughter weren't 'connected'...lucky for me she is rarely without her electronics! Your card is a wonderful reminder of 'mom', and is sure to be cherished. I love the bright colors on the kraft card, so pretty! Very beautiful! I love all the bright colors! Love the embossed kraft and BRIGHT colors of your card. This is gorgeous! Safe travels for your daughter. I would worry, too! Love this bright fun card! What a great sentiment! Pretty! I love all the bright colors! I've so enjoyed your GIU week. This card is fantastic. Your daughter sounds like she has an adventurous spirit and that's to be admired. It's just very challenging for those near and dear to her, I'm sure. Wish her the best! Your washi tape, buttons and everything look so great together. Your daughter will love it. I hope that she has a great trip. That is a very bright and cheerful card, love it! very Pretty card!! Love all the colors!! Such a pretty card! Love the bright colors with the kraft! Your DD will cherish it! Such a colorful and cheerful card! TFS! Awesome card! I LOVE the bright colors! Beautiful bright card. I am sure this will be a nice surprise for your daughter, as she takes off on her adventure. Wishing your daughter a fun and safe trip. And wishing you peace as she embarks on this journey! What an amazing button! What a perfect card both to highlight it and also to finish off your GIU week! Super bright & cheery! Just right for sending your daughter off! Love the colors with your Button and I'm sure your daughter will love it. Texture, colors, and pure joy! 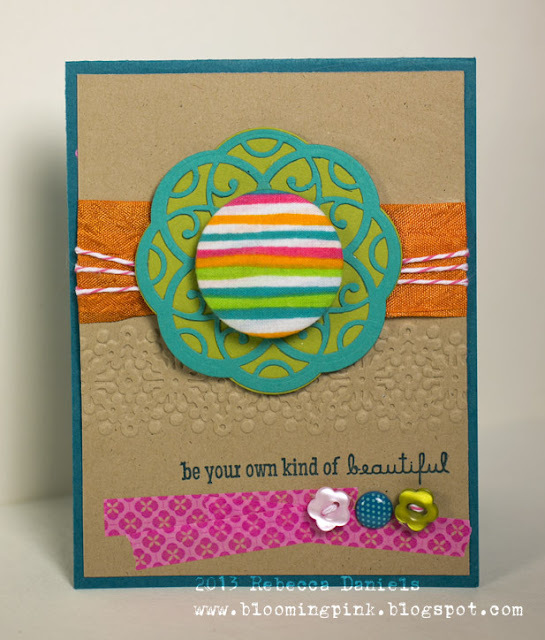 Fun card and great colors on the kraft background! I am catching up today.... had foot surgery a few days before Christmas and have been on the couch most of the time! Happy to see your GIU week cards! Wonderful colours, they really pop!!! Very fun card. This is beautiful, Rebecca! I love the bright colours and especially the hot pink washi tape and embossed strip!